Mastiff Names - What Name Would Be Best For Your New Puppy? You are here: Home / Dog Names / Mastiff Names – What Name Would Be Best For Your New Puppy? Mastiff Names – What Name Would Be Best For Your New Puppy? The gentle giant called the Mastiff goes by many different names. 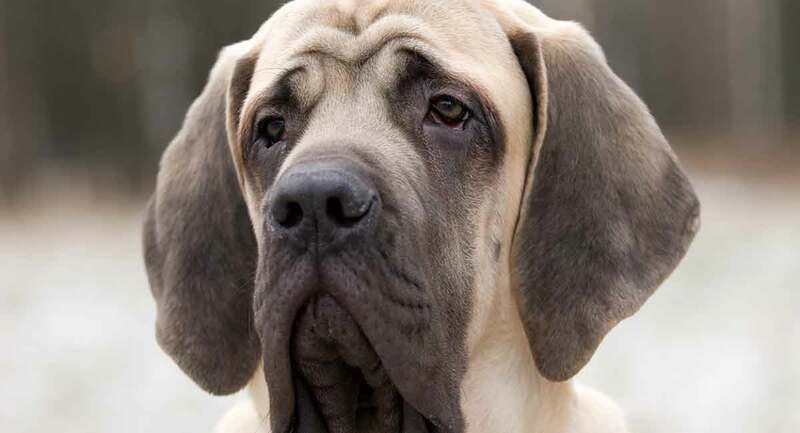 Some of the best known Mastiff dog breeds include the Neapolitan Mastiff, the Tibetan Mastiff, and the Bull Mastiff. However, each of these breeds shares something in common – their size! They also share a reputation as fabulous guard dogs and protectors. Brainstorming Mastiff names can take you in some interesting directions! Naming your Mastiff puppy or rescue dog isn’t something you should rush into. After all, you will be using the name for years to come! Try not to put too much pressure on yourself to come up with the perfect name right away. Chances are good if you just play with your pup and enjoy each other’s company. The right name will occur to you in a moment you aren’t even thinking about Mastiff names! Make sure the name you pick is short since you will likely be using it a lot, especially during housebreaking and training! Before settling on a name, make sure it doesn’t sound too much like important commands you want your Mastiff puppy to learn. You may want to steer clear of naming your Mastiff pup after a friend or family member unless you are absolutely sure they are okay with it. Choose a name you won’t mind saying out loud around strangers at the dog park or as you go out and about in your neighborhood. The Mastiff’s ancestors are some of the most primitive of all dogs that have walked on this planet! We think you will agree that some of the best Mastiff names are derived from this dog’s reputation. These female Mastiff names hearken back to the Mastiff’s long and fascinating history. Giving a nod to influential places and people that have helped the Mastiff become a beloved modern dog breed! From tough to tender, you can find more female Mastiff naming inspiration by reading this list of female dog names. The mighty male Mastiff is as manly and masculine as a dog breed can get. These male Mastiff names are drawn from some of the many notable patrons the Mastiff has enjoyed over the centuries. For even more masculine and manly male Mastiff names, read through this comprehensive list. These cool Mastiff names take inspiration from sizeable celebrity pups and their owners in movies, stories, dog shows and history! Check out even more cool Mastiff names by heading over to review the names in this article. The Mastiff dog breed is proof that dogs can be irresistibly cute at any size. These cute Mastiff names do their best to capture the snuggly, cuddly cuteness that is a Mastiff pup! Looking for more cuteness in name form? These cute names are also great candidates for your Mastiff pup’s new name. If it is one thing this sizable pup can’t seem to help, it is making people smile. These funny Mastiff names give a nod to the comic inside each noble Mastiff protector! The Mastiff breed is unique in every way. And there will never be another dog quite like your canine bestie, as these unique Mastiff names can attest! Seeking even more unique dog names ideas so you can find the perfect Mastiff name? This list might have just what you are looking for. To look at a Mastiff, it would seem “tough” is this dog’s middle name. These tough Mastiff names let everyone know the pup in your life is a true heavyweight! For even more ideas for tough names fit for your sizable canine, check out this comprehensive list. The Mastiff dog breed is so ancient even historians are not completely sure exactly when these dogs first appeared. Some evidence suggests the Mastiff dates back to 2,500 B.C. in Babylonia (Asia). Mastiffs have always found favor with royalty as fighting dogs, guard dogs, and loyal companion dogs. A French word defined to mean “watchdog”. Mastiff dogs may have a background as war dogs and fighting dogs, but this breed is actually known for their gentle, peaceable temperament! Mastiffs are very family-focused and are great with kids and people of all ages. As this article highlights, a home with a Mastiff in it is likely to be a very secure home indeed! One thing new Mastiff owners typically discover very quickly is that Mastiffs are champions of drool! Collings, D. “History of the Mastiff,” Mastiff Club of America, 2018. Atkinson, T. “A Brief History of the English Mastiff,” The Old English Mastiff Club, 2018. Feltenstein, M. “A Brief History,” American Tibetan Mastiff Association, 2018. Underwood, E. “How Mastiffs Became the World’s Top Dogs,” The Smithsonian, 2017.